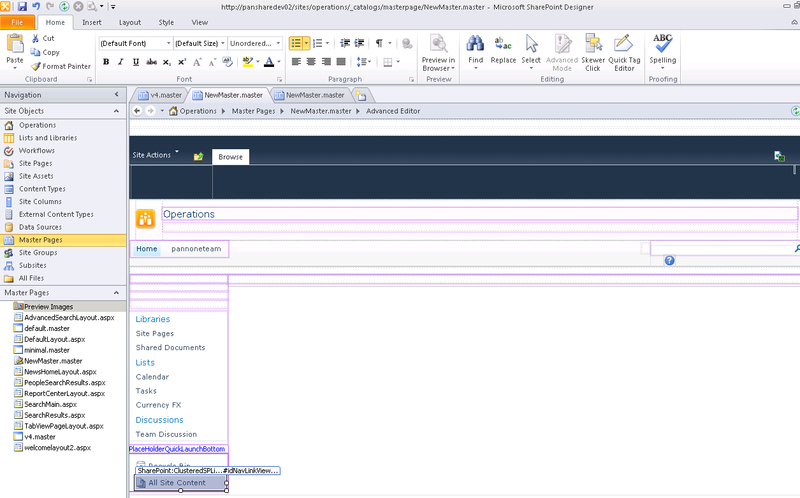 .NET Source Code: How to brand a Sharepoint 2010 Site with Sharepoint Designer. 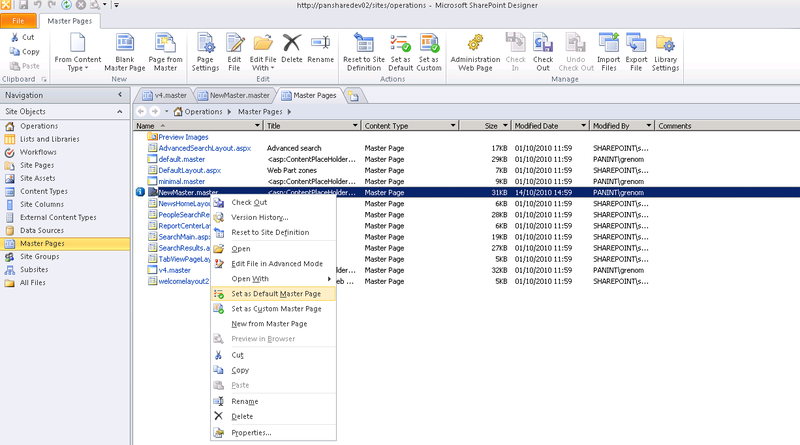 How to brand a Sharepoint 2010 Site with Sharepoint Designer. So, we need to rebrand our ugly Sharepoint site and transform it into a beautiful corporate page. I am not going to enter very deeply in design stuff I will only show how to do it in the nicest way. We will use the designer for this task, just because is far away from any notepad, as we can see what we do in real time by accessing the code or modifiying the design. 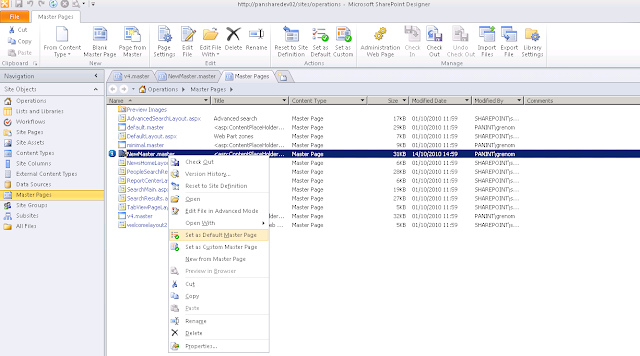 SharePoint Designer 2010 delivers a unique site authoring experience by providing one place where you can create a site; customize the components that make up the site; design the logic of the site around a business process; and deploy the site as a packaged solution. You can do all this without writing a line of code, what is quite nice, but it allows us to write code if we want as well!. 1- On the Site Actions menu, click Edit Site in Sharepoint Designer. 2- In the Site Objects panel, click Master Pages. 3- Right-Click v4.master and then click Copy. 4- Press CTRL+V to paste a copy of the v4.master file. 5- Right-click v4_copy(1).master and then click Rename. 6- Rename the file to NewMaster.master. 8- Click the Design tab. 9- Near the botton of the "Quick Launch" bar click All Site Content and then press DELETE. 10- In the "Quick Launch" bar, click Libraries and then on the toolbar, click Align Text Right. 11- Click Save and then click Yes. 13- Right-click NewMaster.master and then click Set as Default Master Page. 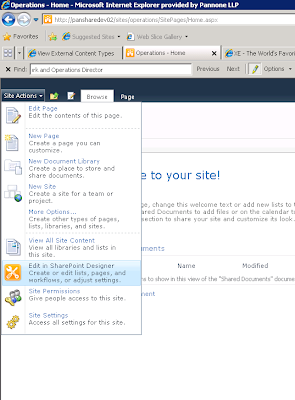 Brand Sharepoint sites has never been easier, but in my own experience try to use the Designer if you don't want to blow up the whole master page. 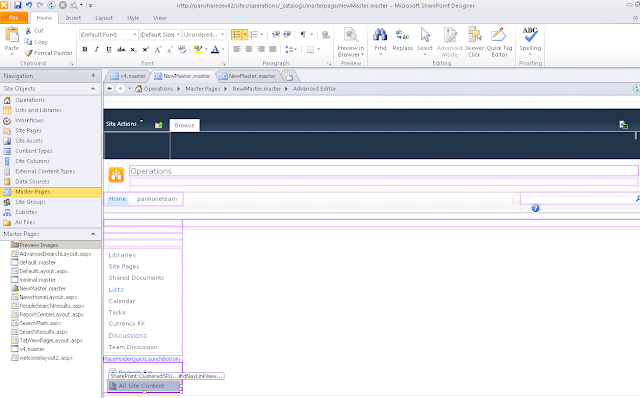 The best practice is to develop master pages in Sharepoint comes by creating copies of the original one, so if you mess around too much you will be able to come back. Don't forget to test the links to see if everything works as you expect.